Hyderabad, April 11: Voting for the first phase of Lok Sabha elections began for 91 Parliamentary constituencies spread over 18 states and two union territories began on Thursday. While it was an exciting experience for first time voters, the polling day turned out to be a bad experience for some. For Apollo hospital's Chief's Daughter Shobana Kamineni, it was a terrible day as her name was deleted from the voters' list in Telangana. Shobana expressed displeasure as she couldn't find her name in the voter list at the Masab Tank polling booth in Hyderabad. Telangana Lok Sabha Elections 2019 Schedule: Constituency Wise Dates Of Voting And Results For General Elections. 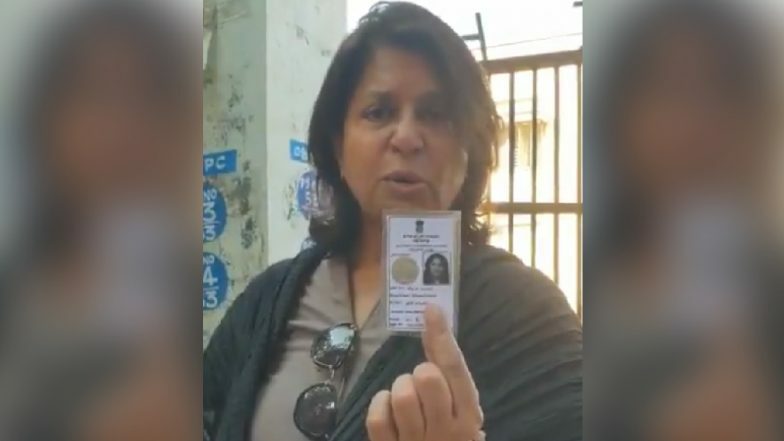 Anguished by the incident, Kamineni took to Twitter to express her rage and said she felt cheated after she was told at a polling booth in Hyderabad that her vote had been deleted. The top executive, who had returned to India from a foreign tour just to vote, said ,"This is the worst day for me as an Indian citizen". The Former CII chief and the daughter of Apollo hospitals chairman Prathap C Reddy said, “I feel cheated as a citizen. Does my vote not count?”. "Am I not a Indian citizen? Am I not counted in this country? Is not my vote important?" Kamineni added. Hyderabad Lok Sabha Constituency in Telangana: Candidates, Current MP, Polling Date And Election Results 2019. Shobana, who is also the sister-in-law of a Congress candidate for the Lok Sabha polls from Chevella, added saying that this act is crime against her as it was the same polling booth where she had exercise her electoral right for the Telangana Assembly elections in December. Polling in 25 Lok Sabha constituencies in Andhra Pradesh and 17 constituencies in Telangana began on Thursday. Voters in Andhra Pradesh will also cast their votes to elect 175-member Assembly. In 2014 elections, the TRS had bagged 11 seats, the Congress had won two while the TDP, BJP, AIMIM and the YSRCP had secured a seat each. This time, the TDP and the YSRCP are not contesting the elections in Telangana.